With the population down from 264 to 60, the station since close is much emptier. In addition to the general quiet which pervades the area, there is now quite suddenly free space. While we were crammed in like sardines through the summer, now everyone has room to stretch out. There are 50 "winterover berths" on station, basically bigger rooms for winter folks to live in. 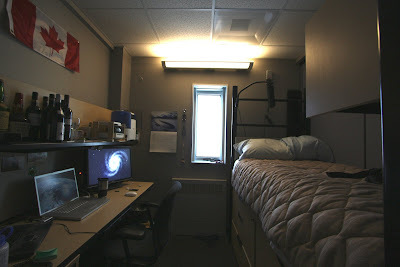 All summer I was living in one of the summer rooms, which contained a bed, a 2' walkway next to it, a miniature desk straight out of elementary school, and a chair which completely blocked the walkway. If you sat at the desk, you had to climb over the bed to get past the chair and to the door. I like tight spaces, but even I'll admit, calling the summer rooms cozy is generous. Winterovers affectionately refer to them as "coffins". I can see why. Anyway, with 60 winterovers and only 50 large rooms, there was some competition for them. I finally got one three days after station close, and after the coffin, it seems like a luxury suite. I can get from my desk to the door without climbing over anything, I can put on a shirt without scraping my knuckles, and I have enough desk space for a laptop AND a pencil. There's even a window with a view of the old dome station. I love my new room. We've rearranged the galley to include a little cafe at one end, science lab has been cleaned out and reorganized to give us all the space we need, there is no longer the ongoing struggle for desks at DSL, and generally everything has gone from cramped to spacious. A friend back in Chicago referred to the summer population as tourists, commenting that I should be glad to finally be rid of them. In a funny way, nothing could be truer. Of course, it's going to get a little lonely here sooner or later, but so far, I quite prefer the smaller population. I'm glad to see the Canadian flag there, Vanderlind-e! Congrats on the posh new digs; they're definitely larger than my first studio apartment in New York, which was *hilariously* small. I love your little room. It looks so cozy. Yes, I'm sure it's actually quite cramped, but you have it fitted up so nicely.